This week, I had to unexpectedly make and send a sympathy card. My friend Colleen's mom, Barbara, passed away after a decades-long battle with extremely debilitating multiple sclerosis. Barbara was a big part of my life when I was young. She was my first 4-H leader. She is the one who introduced me to most of the crafts I do today. She taught my first breadbaking class, as well as stitchery, stenciling, miniatures, and many more. Barbara was a talented artist and cook who loved to share her interests. 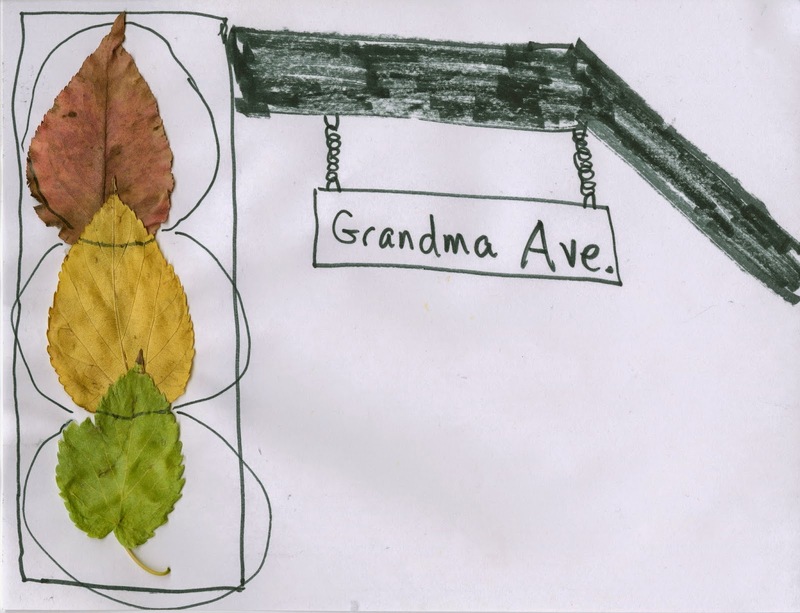 I spent many, many happy hours in her kitchen cooking, crafting and creating, long after the 4-H classes ended. Barbara was infinitely patient, extremely generous, and incredibly kind. It was heartbreaking to watch her MS develop to the point that she couldn't do the things she loved the most. Yet amazingly, she never lost her positive outlook nor her faith. She was, in a word, special. She will be missed by many. As always, I agonized over what images and what words could possibly bring comfort. Sympathy cards never get easier for me. My condolences to the entire Foudy family and all who loved her. 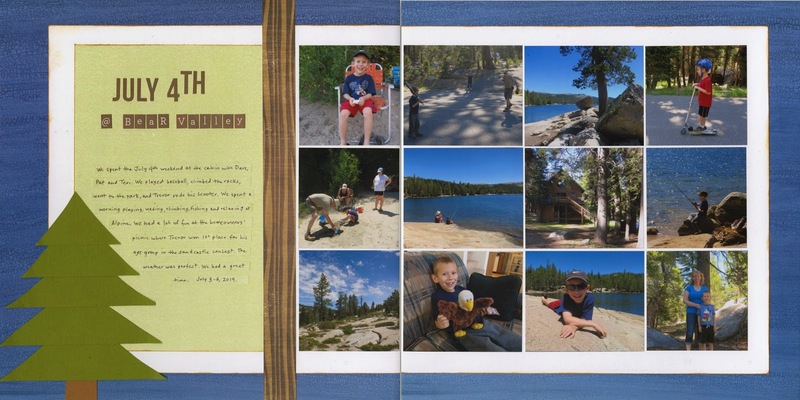 I just scanned and uploaded my latest layout, this one about spending the July 4th weekend in Bear Valley. I like how it turned out and how many photos I was able to use without it looking crowded. However, when I went to put it in the album using my post-it note / scrapping-out-of-order system, I realized I had a problem. I only had room for a 1 page layout in the designated space, not a 2-pager. My post-it notes rarely fail me. But in this case, I'd dedicated two pages to the trip, then ended up making a 1-pager about our visit to Columbia State Historic Park and this 2-pager, for a total of three pages from the same trip. Oops. Because of the configuration of 1- and 2-pagers already in the album, I couldn't just shift things without splitting a 2-pager, which is unacceptable. My tentative plan is to reduce a planned 2-pager down to a 1-pager, which is not ideal. The alternative is to add a page protector and insert a 1-page unplanned layout into the space. That might be a better choice, as I occasionally have 'everyday' types of layouts that don't need to stay within a strict chronology. Time to share another of my CD crafts! We're gearing up for Christmas around here (the decorations will go up Sunday, the start of Advent) so I made a wreath. Materials: old CD, gesso, green paint, green yarn, sequins, ribbon. Start by putting a coat of gesso on a CD and let that dry. Paint the CD green. Tape one end of the yarn to the back of the CD, then wrap it around and through the center until the CD is covered. Cut off the excess and tape it to the back. Use the excess yarn to make a hanger. Glue sequins randomly to the front of the wreath. Add a bow and it's ready to go! 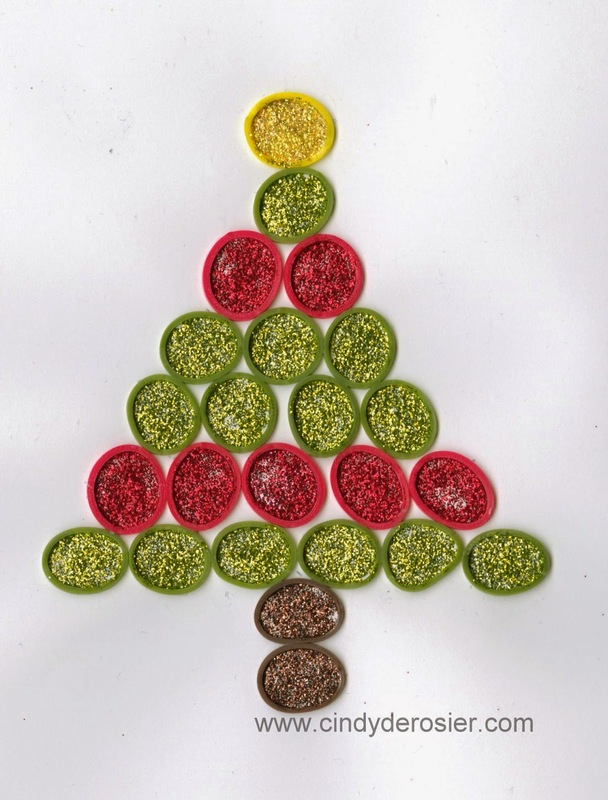 For those who celebrate, when do you decorate for Christmas? Steve and I missed the Cub Scout ceremony last year where Trevor bridged from Tiger to Wolf because it fell on our anniversary and we'd already booked a non-refundable B&B for the night. Grandma took pictures, which was the next best thing to being there. This year, Steve and I were there to watch Trevor bridge from Wolf to Bear. 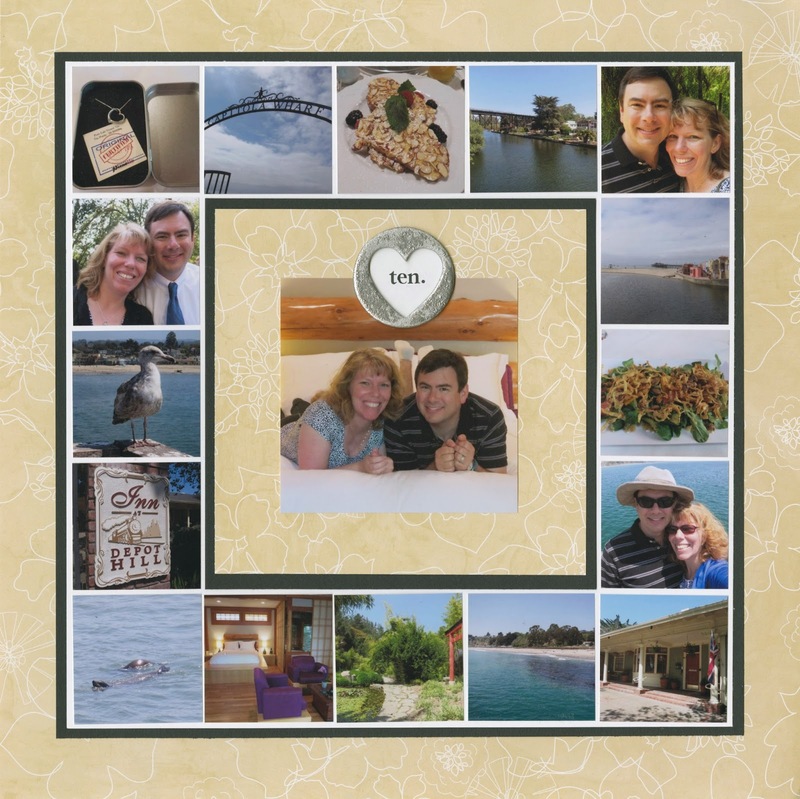 We took a ton of pictures, which I narrowed down to four for this layout. In the top left, Trevor and the rest of his den are dressed in the yellow of the Wolf rank. In the top right, Trevor has removed his Wolf items and is almost halfway across the bridge that signifies advancing in rank. In the bottom left, I'm presenting Trevor with his Bear gear. 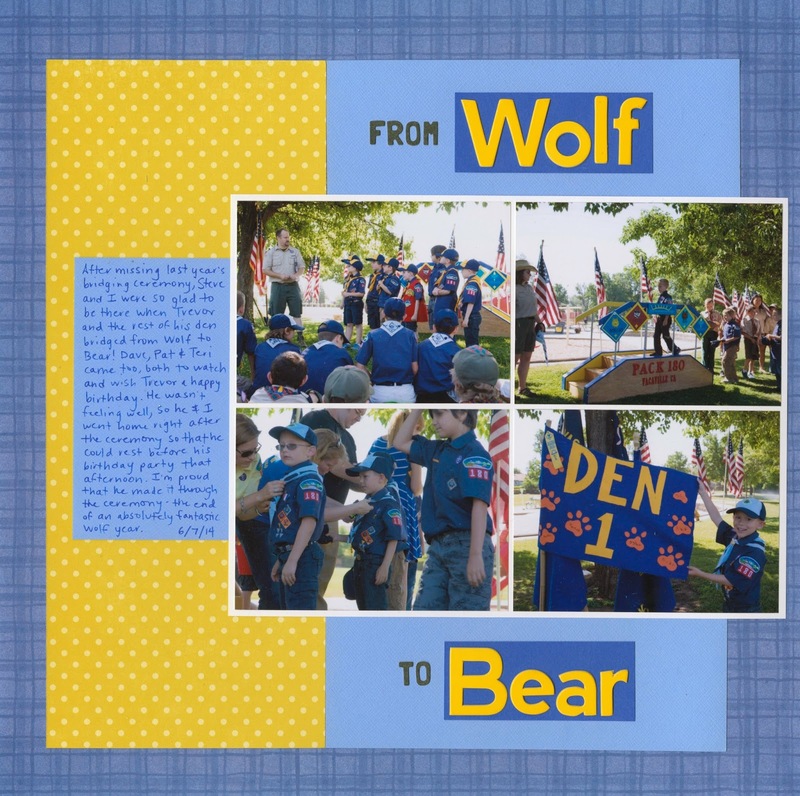 And in the bottom right, Trevor is dressed as a Bear and standing with the Den 1 flag. Ready for another CD craft? Once I started thinking about what to do with old CDs, the ideas kept coming and coming. Today, I'm sharing clowns. Materials: old CD, white gesso, paint, googly eyes, pom poms, and ribbon or yarn. Begin by putting a coat of gesso on the CD and letting it dry. Go over it with white paint if the coverage isn't complete. Paint a face onto the clown. Anything goes! Glue a pom pom nose over the hole in the center of the CD, then add googly eyes. Finally, add hair. Curling ribbon is a fun option, but you can experiment with raffia, yarn, or any other materials. They're each so different! I can imagine these three clowns working together to come up with a hilarious routine. They each have their own distinct personalities. Time for another CD craft! Materials: old CD, gesso, pink paint, pink craft foam, water bottle lid, googly eyes, and a pink pipe cleaner. Paint the CD and the water bottle lid with a coat of gesso. When that dries, paint them pink. Cut the craft foam into a circle that is the same diameter as the water bottle lid and glue them together. Then cut two triangle ears. Use a strong adhesive, like Glue Dots or a glue gun, to fold the ears over. Glue them to the back of the CD. Glue the lid nose in the center, covering the hole. Add the eyes. 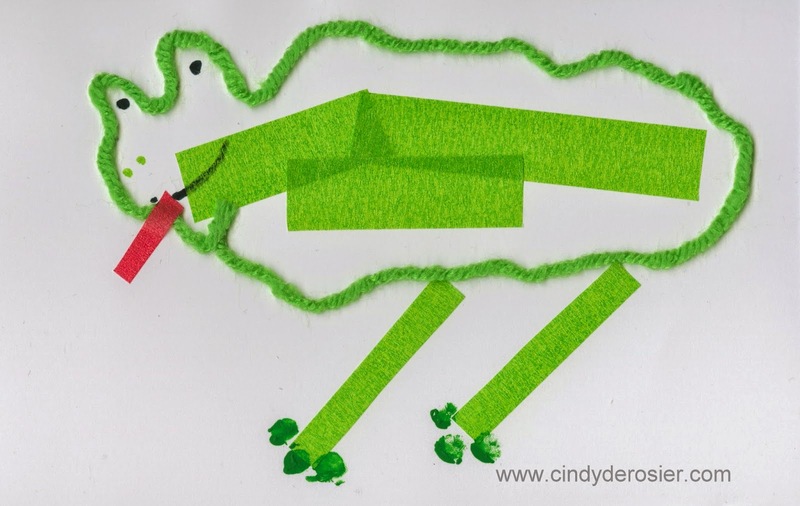 Twist the pipe cleaner to make a curly pig tail and glue it in place. I experimented with a couple of mouths, but I thought he was cuter without it. 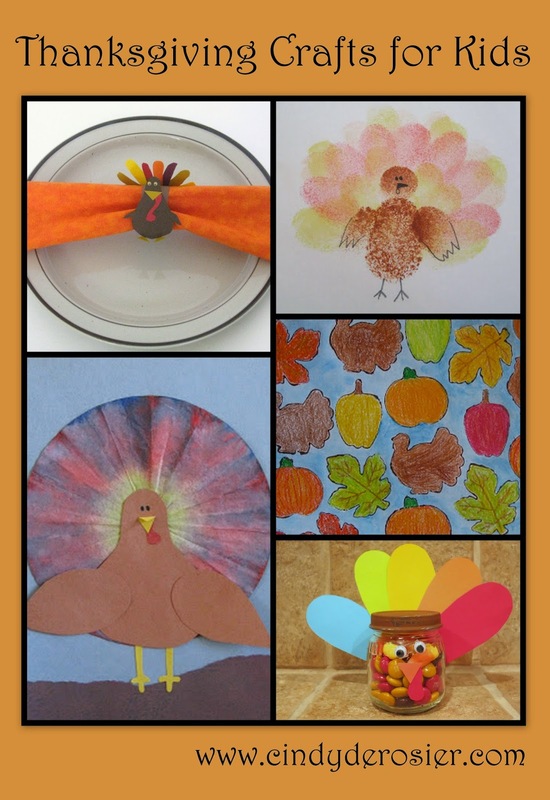 Need some ideas for a Thanksgiving craft for the kids? Or perhaps The Thankful Game to play with your whole family? Or a really, really good cranberry recipe? Crafting, games, and foods with cranberries in them. That's pretty much my ideal holiday. On Friday, Steve's coworkers held an event at the office called "Sides and Wine." Each employee was invited to make a dish to share, which would earn them the right to eat for free. Anyone who didn't bring a dish would pay $5 to eat. Similarly with wine: those who brought a bottle would drink for free and those who did not would pay $10. They also had a 50/50 drawing. All money collected went to the Food Bank. One talented person's food would win the coveted title of Favorite Dish. Steve was eager to participate. But there was a problem. The event was in Ohio where the office is and Steve (who works remotely 95% of the time) was at home in California. So naturally, we held our own deRosier version of the event to coincide with theirs. We'd just been to Costco and picked up a pack of their tasty-looking fresh naan bread, so we decided that each of us would create a dish using naan. We did a quick grocery run, then Trevor was up first. He made some failed attempts to slice the naan open like a pita, then eventually cut the naan into squares and popped it in the toaster oven. Then he made some guacamole. Under his direction, I helped him safely slice, marinate, and cook very thin strips of flank steak. He put down one square of toasted naan, topped it with torn pieces of romaine, put steak on top of that, then added the second square of naan. He decorated the plate with his guacamole, some salsa, and sour cream. We ate Trevor's course and discussed its merits. Trevor decided that the most fair way to judge this contest would be for the two people who did not make the dish to each give it a number from 0-5, then whoever got the most points from the other two would be the winner. I wanted to give Trevor's a 5 because it was REALLY good, but I wanted to leave some room at the top in case Steve's was even more amazing. So I gave Trevor a 4 1/2. Steve gave him a 4, giving Trevor an impressive 8 1/2. Next to serve was Steve. I didn't take any photos of him cooking, mostly because I was prepping my dish at the same time. Steve made naan pizzas. There's a whole pizza of ham and pineapple (the only pizza that all three of us like), one with pepperoni on one half and salami, pepperoni, and olives on the other. Here's Steve with his pizzas. They were REALLY good. I went back and forth deciding if they were better than Trevor's. In the end, I decided that I liked both dishes the same (which is to say, a LOT). I gave Steve a 4 1/2 and Trevor gave him 4 7/8, which moved Steve into the lead. It would be extremely difficult to beat 9 3/8, but I was up for the challenge. I cut the naan into circles and triangles. I toasted those, then brushed them with melted butter and sprinkled a generous amount of cinnamon and sugar on top. I gently sauteed apples in a little bit of butter, then soaked them in a sauce of reduced apple cider, brown sugar, cinnamon, and vanilla. I added a dollop of whipped cream. It too was REALLY good. At least the apples and the sauce were. The naan was too thick to function as a substitute for a toile or puff pastry and too toasted to properly soak up the sauce. We all agreed that it tasted excellent but that the texture was off with the naan. Trevor gave me 3 7/8 and Steve gave me a 3. Congratulations to Steve, official winner of the deRosier Naan Challenge of 2014! To celebrate his victory, we made a donation to our local Food Bank. That way, everyone is a winner. Last week, I shared super cool rubber band art we made from Amanda Formaro's book called Rubber Band Mania. 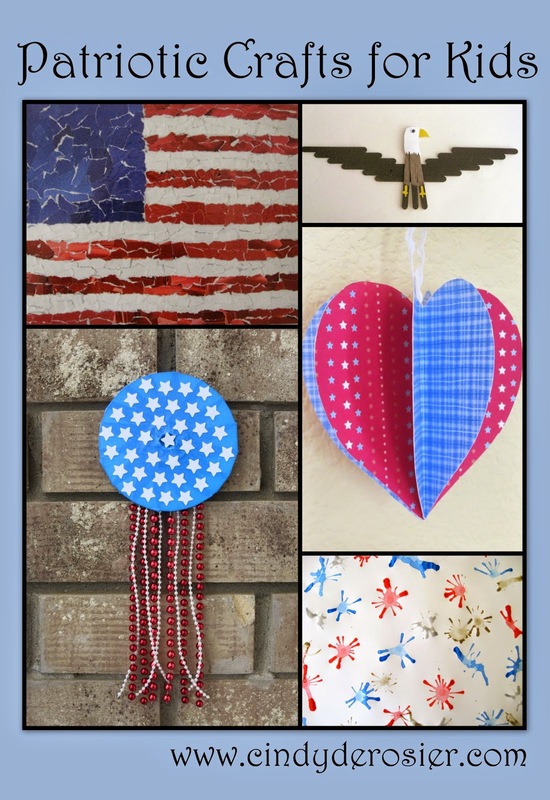 Today I'm sharing two projects we made from her book Duct Tape Mania. For the sake of disclosure, I will repeat that Amanda is my boss at Fun Family Crafts and she gave me these books. My opinions, as always, are 100% my own. When Amanda's books arrived, I dug around and discovered that (as I suspected) we only had boring silver duct tape. Trevor and I headed to the store to see what we could find for the many projects we'd be making. So many choices! We went back and forth, debating pros and cons of different colors and prints, comparing prices (prints are more expensive than solids, and licensed character prints are MUCH more expensive than generic prints). Trevor is now a very savvy comparison shopper (thanks to both the Mathematics Belt Loop and Pin and his Canada souvenir budget) and I was really impressed when he suggested we buy solid white because it is cheaper, then decorate it with Sharpies or other art materials to make our own patterns. 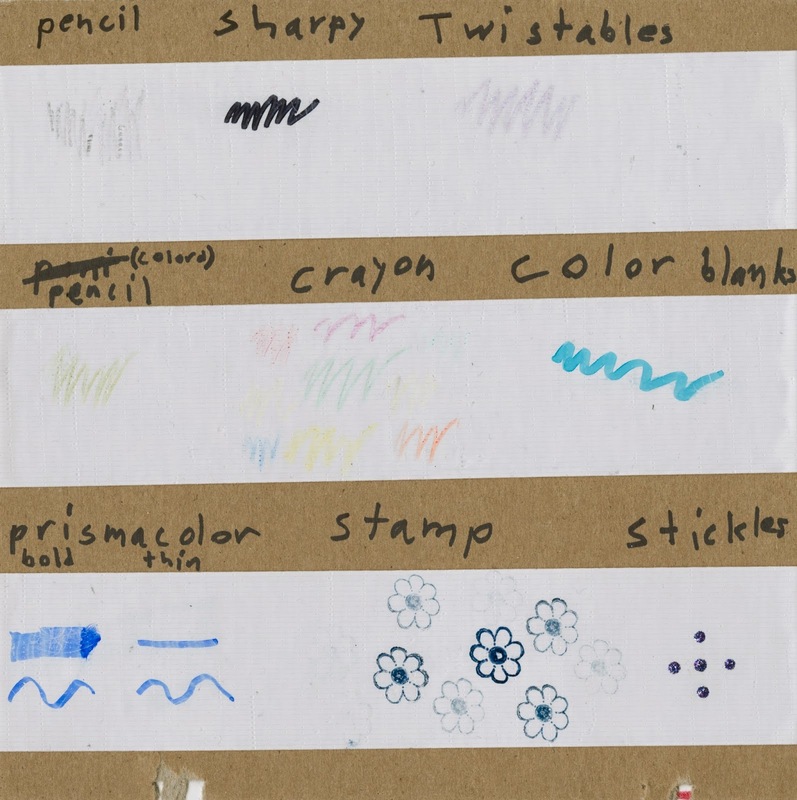 As you can see, an ordinary pencil, Twistables, colored pencils and crayons do not show up well on duct tape. 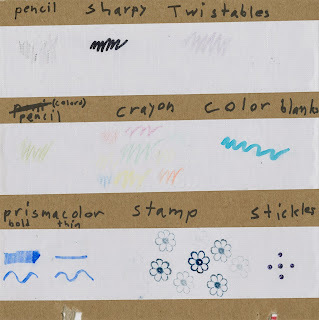 Sharpies, Color Blanks (which are like Sharpies), Prismacolor Art Markers, rubber stamps (stamped with StazOn ink), and Stickles all work well. Trevor thumbed through the book and decided he wanted to make an organizer. I selected a cool braided bracelet. But first, Trevor wanted to try the duct tape magic trick from the book. It was awesome and worked just as Amanda described. However, there was only one problem, which turned out to be a problem we had with every project in the book. Trevor is not strong enough to pull or rip duct tape without help. While he was able to do most of the projects from Rubber Band Mania independently, he needed my help pulling, ripping, and/or cutting duct tape every single time. Since I like crafting with Trevor, it wasn't a big deal. But I do want to note that younger children might not be able to use Duct Tape Mania independently the way they could with Rubber Band Mania. Once I prepared strips of duct tape for him, Trevor was able to make his organizer. He covered a rectangular box, then made some dividers and handles. Finally, he decorated it with Sharpies and Stickles. While he decorated, I made my braided bracelet. It was really easy and I love how it turned out! The most difficult part about it was photographing my own arm. Thanks again to Amanda for these excellent books! 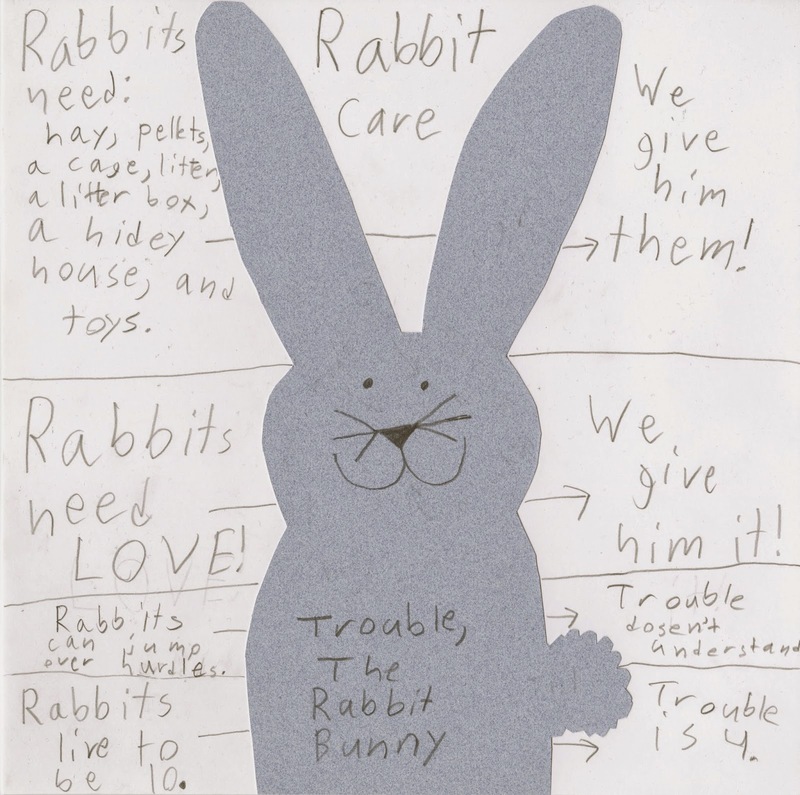 We love them and I'd highly recommend them for the young crafter in your life. 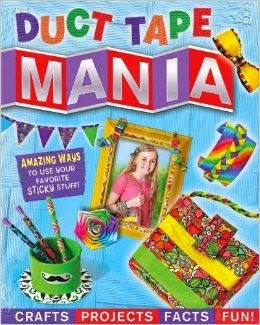 You can buy Rubber Band Mania and Duct Tape Mania on Amazon (affiliate links below) or in stores like Walmart or Target. Only six more months before the Cub Scout Belt Loop (Academic and Sports) Program will be discontinued. Trevor is continuing to work on earning as many as he can before that deadline. We've already accepted the fact that he will not be able to earn them all. The toughest ones are team sports, especially the ones involving specialized equipment. Hockey, for example. We don't exactly have frozen ponds around here and you can't just show up at an ice rink having ice skated exactly once and participate in a hockey game. Here's where Trevor is right now. 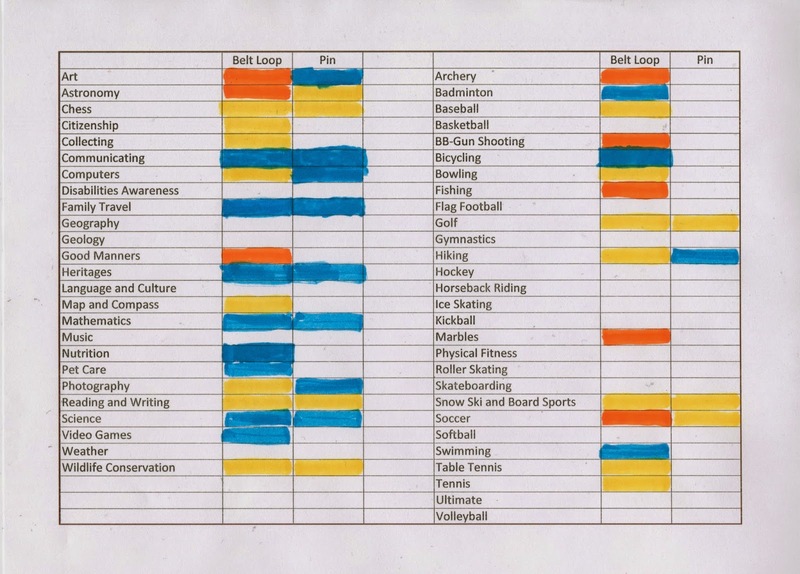 The blue are the ones he's earned so far during his Bear (3rd grade) year. The back looks pretty ugly. I just glued some tongue depressors on the top and bottom to provide rigidity and stability, then added a sawtooth hanger to the top. Like I said, this is just a temporary display until Trevor makes a proper one. Stay tuned! Trevor is a talented person with lots of strengths. Many things have come naturally to him over the years. Unfortunately, swimming is not one of them. Steve and I both learned to swim very young and swam competitively throughout our childhoods. It is important to us that Trevor becomes a strong swimmer. Despite years and years of swim lessons, he is still not water-safe. 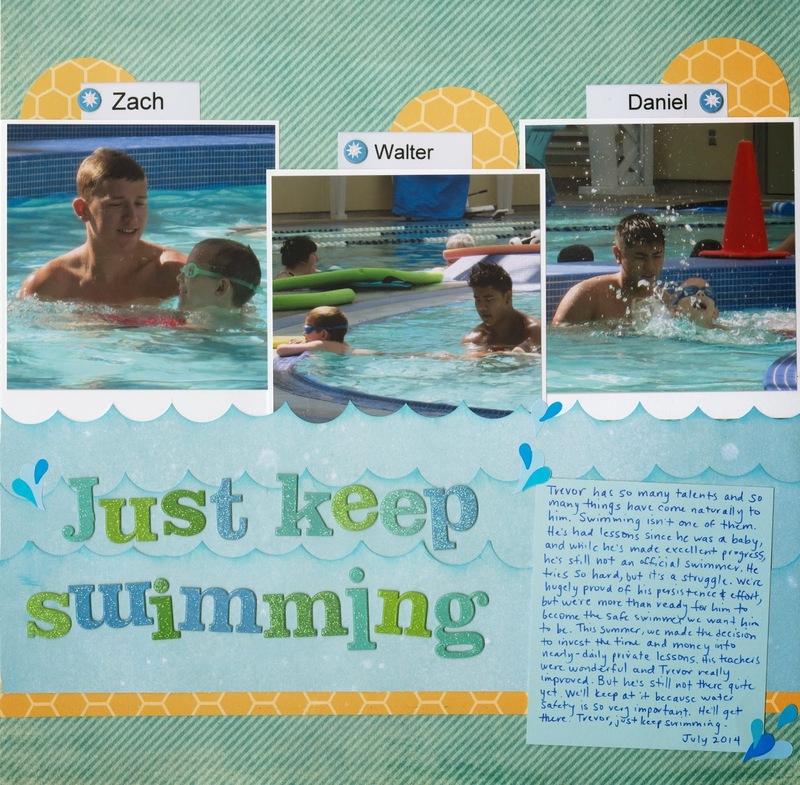 This past summer, we invested the time and money into nearly-daily private swim lessons for Trevor. He had excellent teachers and made significant improvements. All of us (Steve and I, Trevor, his swim teachers) were hoping that Trevor would make enough progress to pass the swim test at Cub Scout Camp in late July. He didn't. Just keep swimming, Trevor. You'll pass that swim test eventually, hopefully next summer. We're so proud of all the hard work you've put in so far and can't wait to celebrate with you when you finally accomplish that goal. 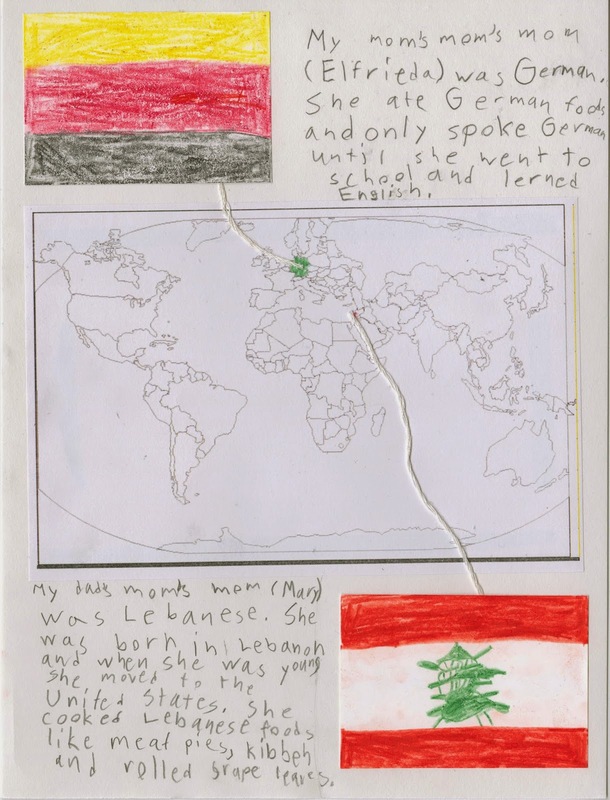 I wanted to share one of the projects we made during our book review craft day that was not inspired by Amanda's books. I was finishing up my awesome (if I do say so myself) Glitter Art Gumball Machine when Trevor announced that he had an idea for a frog project. He wanted me to drop everything and make one, but I was up to my elbows in Stickles and wanted to keep going. Jonna cleared aside her spot at the table and followed along as Trevor explained what to do. Materials: masking tape (green and red), green yarn, craft glue, green paint, black and grey pens, and a white cardstock background. According to Trevor: Begin by putting three stripes of green tape on the cardstock. 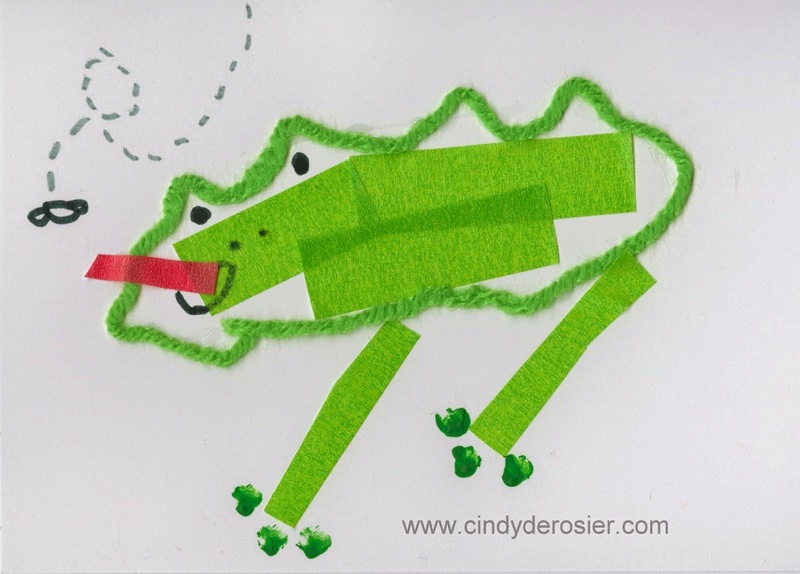 Use the craft glue to draw a line the shape of a frog around the tape. Put the green yarn in the glue. Cut two more pieces of green tape for legs. Use your pinky to put tiny toes of green paint on each foot. Draw eyes, nose and a mouth with black pen. Add a tongue of red tape. Draw a fly with the black and grey markers. Done! Here is the one Jonna made. She followed Trevor's directions closely, though she decided not to add a fly. 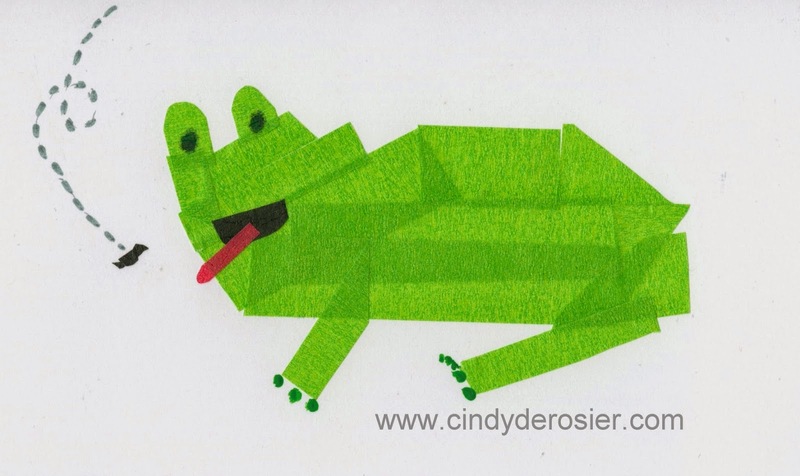 When I finished with the Glitter Art, I made my own version of Trevor's frog. As you can see, I didn't use the yarn. Instead, I created the whole body from cut pieces of green tape. I used black tape for the mouth and the fly. Other than that, I followed Trevor's directions. One of the best things about Cub Scouts is that the boys get so many awards, like patches, for participating in activities. One of the worst things about Cub Scouts is that the boys get so many patches. The pins and belt loops are not a problem, now that we have a display in place. It only takes a minute to add additional pins and belt loops to the display each month, which includes the time to remove them from the packaging and peel off those annoying cling films. But the patches... ugh. They are a giant pain in the neck to sew and much too difficult for Trevor to do, so the task falls to me. I know there are people who glue the patches in place, but I'm a firm believer in sewing them. When we joined Cub Scouts, we didn't expect to be changing Packs, let alone changing districts. I am so glad that I sewed the council patch and Pack numbers on our uniforms instead of gluing them. I was able to remove them without harming the uniform. Since the new council patch is shaped differently than the original, glue stains would have shown. As you can see, it holds the patches that need sewing, spools of thread in a variety of colors, and a case of needles. You can't see them in the photo, but my foldable scissors are in there too, along with a thimble. I love that everything I need is in one place, ready to go. I also love that there isn't a teetering pile of patches on my desk anymore. I started with one of the plain blue leftover $0.25 pencil cases. I printed a fleur-de-lis, colored it yellow, cut it out, and glued it to the pencil case. It's not going to hold up forever, but that's not a big deal. If the fleur-de-lis comes off in the next 2.5 years of Cub Scouts, I'll just glue another one on, or if I'm feeling especially ambitious, I'll paint one on. In the meantime, I'm happy. 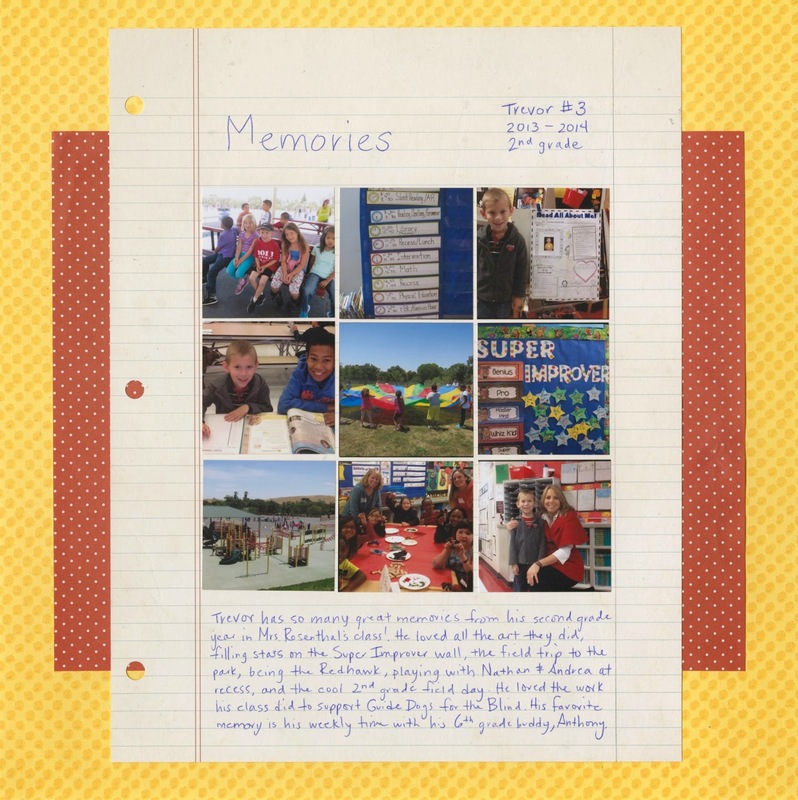 I finally tackled the pile of photos from Trevor's 2nd grade year. The November to June portion, that is. I don't have classroom photos from August-October. 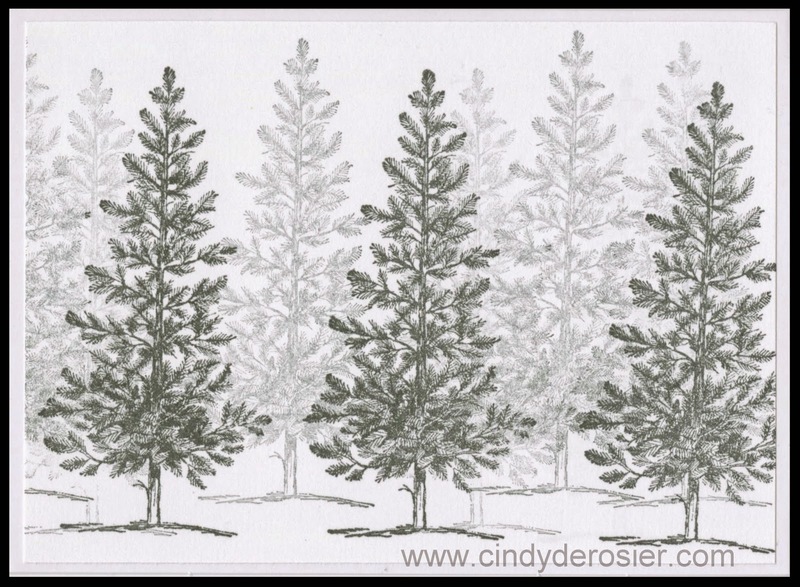 That 'binder paper' actually started as a 12" x 12" piece of lined scrapbook paper. I cut it down to 8.5" x 11" and punched holes on the left, then set up my title, photos and journaling to look like a school assignment. I included Trevor's classroom number in the heading on the right. It's interesting to see what his class number has been over the years. In kindergarten, he had a high number (#28, I think) because the kids were alphabetized by first name. In 1st grade, he was alphabetized with the D's and was #5. When Trevor transferred classrooms during his 2nd grade year, his class number changed from #7 (alphabetized by last name) to #3 (the number that was vacated by a child whose parent had a military transfer). It's a fun little detail that I'm glad I thought to include. Last week, a package came in the mail from Amanda Formaro, my boss at Fun Family Crafts. Amanda is an extremely talented and prolific crafter who now can add author to her already-impressive resume! She was kind enough to send Trevor and me her first two books, Rubber Band Mania and Duct Tape Mania. Let me assure you that I would not be posting a review of these books if I didn't love them. There were no strings attached when Amanda gave them to me; I'm reviewing them because they are great and I think many of you will love them too. Trevor and I sat down with a stack of post-it notes and started marking the projects we wanted to try. He marked so many that he had to go get another stack of post-it notes! Both books have a wide variety of projects, suitable for both boys and girls of a wide range of ages. Some of the crafts are classics but there were an impressive number I'd never seen before (which is saying a lot, given my jobs past and present). We couldn't wait to dive in and try the crafts. We invited Trevor's godmother, Jonna, to join us for a day of creative play. We had so much fun! 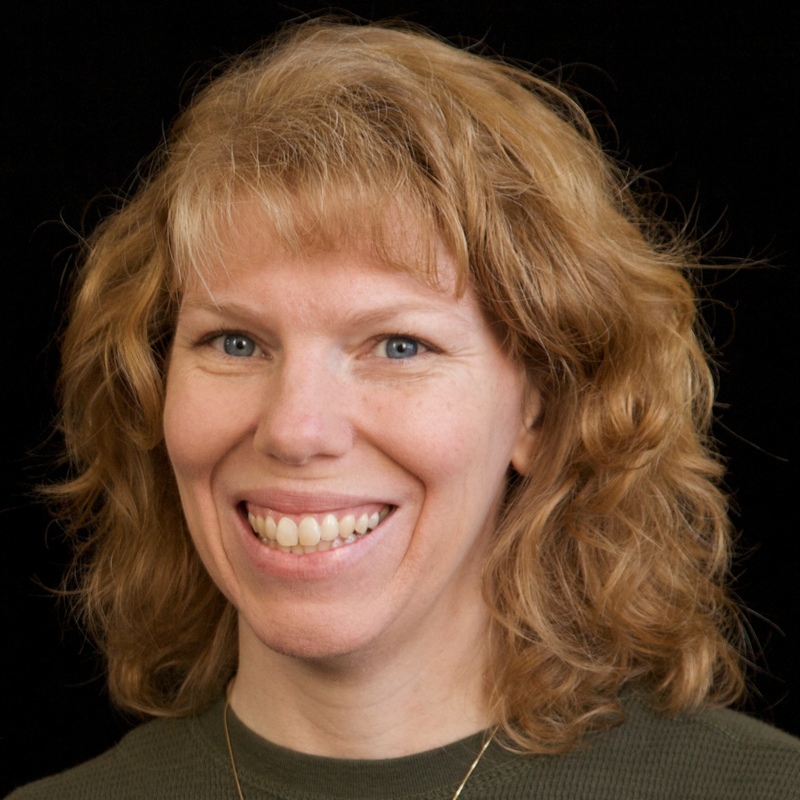 Amanda's books are well-written, have clear instructions, and feature beautiful photography. There are all sorts of fun facts and tips sprinkled throughout. As we worked, I had Trevor read the directions and explain them to us to make sure that the books were as child-friendly as they seemed. 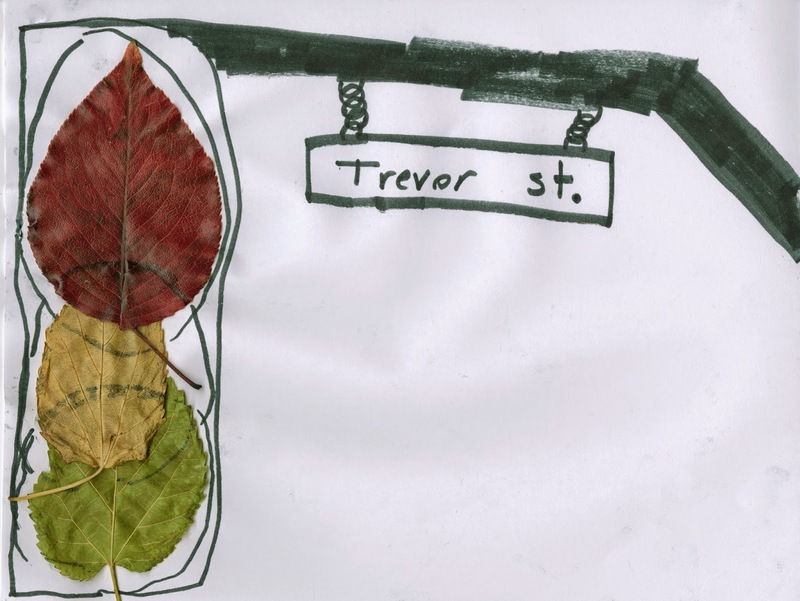 No problem - the writing and pictures made the steps very easy for Trevor to understand. Jonna made a Christmas tree. .... then made this gumball machine. I'm ridiculously proud of it. To make your own Glitter Art, you need an assortment of rubber bands, cardstock or construction paper for the background, craft glue, glitter or glitter glue, and cotton swabs. You might also want pens to create background elements. Start by laying out the rubber bands to make a design. (If you want a background design, like with my gumball machine, draw and color it first.) Then lift each rubber band one at a time, add craft glue to it, and gently press it back into place. Set it aside to dry for at least 20 minutes. 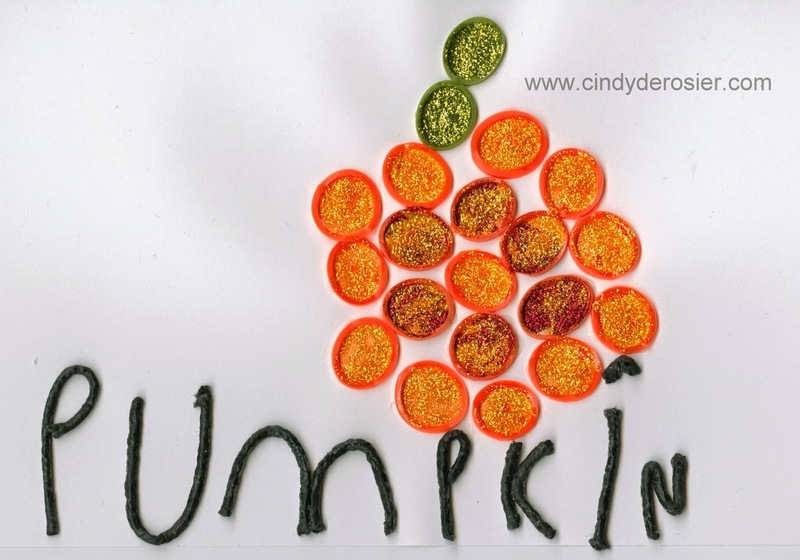 Amanda's next step is to fill the rubber bands with glue and add glitter, tapping out any excess between colors. We simplified this step by filling in each rubber band with Stickles. Easier and much less mess! Let the Stickles dry for a really long time, like overnight. Let's just say that checking to see if they're dry 3 hours later isn't the best idea. This is just one of several crafts that we tried from these two excellent books. It was all great fun. Thanks again to Amanda! I can already see many more hours of crafting fun inspired by these books. 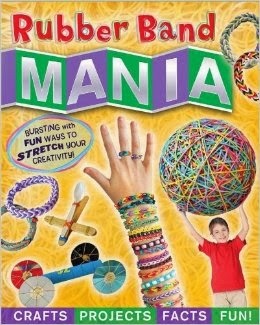 You can buy Rubber Band Mania and Duct Tape Mania on Amazon (affiliate links below) or in stores like Walmart or Target. These would make an excellent Christmas gift for the young crafter on your list.